Was invited by Derrick of Sgfoodonfoot to join him, Metropolitan, Dennis of Superadrianme and Alexis for a Thai Steamboat dinner at MooJaa, Keong Saik Road. My own Moojaa (Thai slang for 'my lovely pig') S dropped me off for the tasting so that he wouldn't feel obliged to finish the food that i waste. According to my wonderful dinner companions who seem to have more experience with the Thai (Club) Food scene (heh), Moo Ka Ta, "Pork Skillet" in Thai, has been catching on in Singapore. 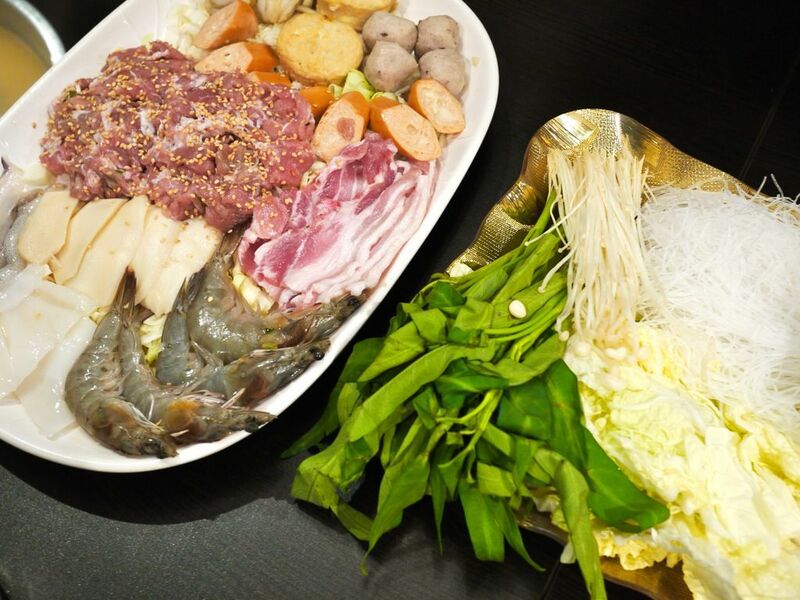 This wonderful combination of both hot pot and barbecue is essentially the reverse pan of the typical Seoul Garden sorta steamboat bbq. I couldn't place an image to it until the pot was served, that's when i realized i had this in Cambodia. 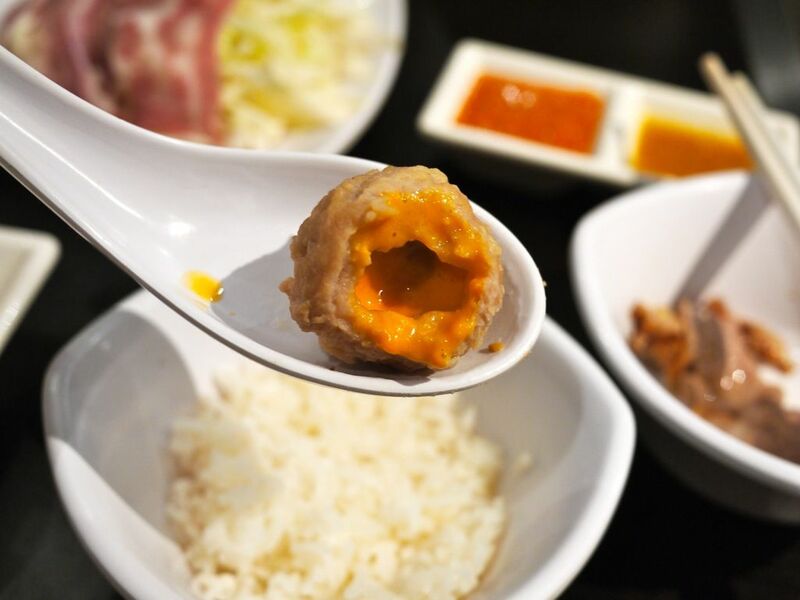 Moo Ka Ta is not a typical Thai thingy as it developed along the border cities. 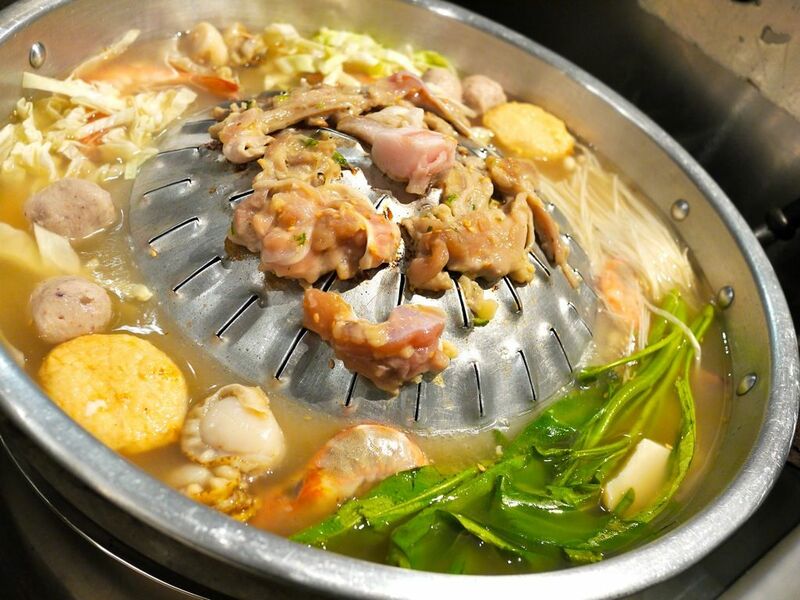 The soup is poured into the shallow trough for the steamboat while the grill dome is for the barbecue. 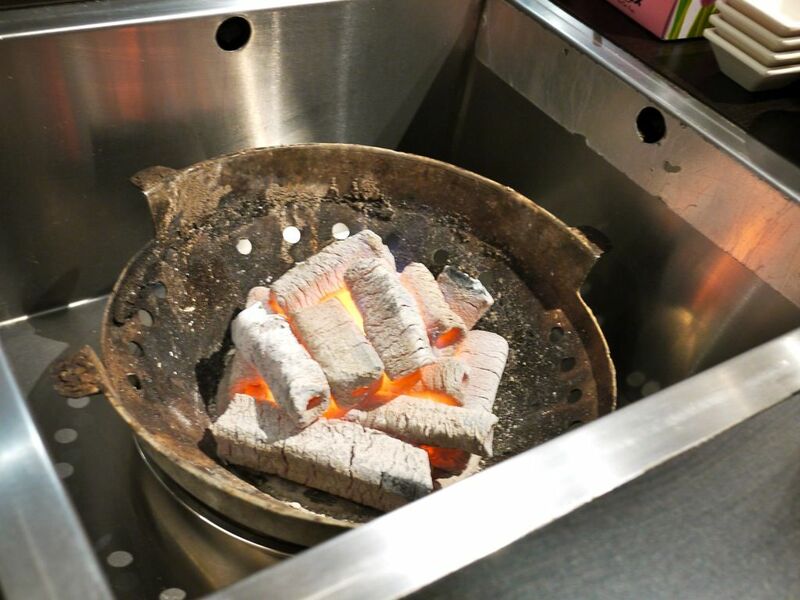 The slits allows smoke from the Binchotan Japanese charcoal to perfume the meat from underneath and apparently it is less acidic than the generic black charcoal. It was only during this tasting that i realized there's a purpose for this design; the essence (aka fats and oil) of the meat would trickle into the soup to give it that smoky and flavorful taste at the end of the meal. A built in ventilation system prevent you from stinking at the end of your meal. Perfect. I hate smelling like bbq food. 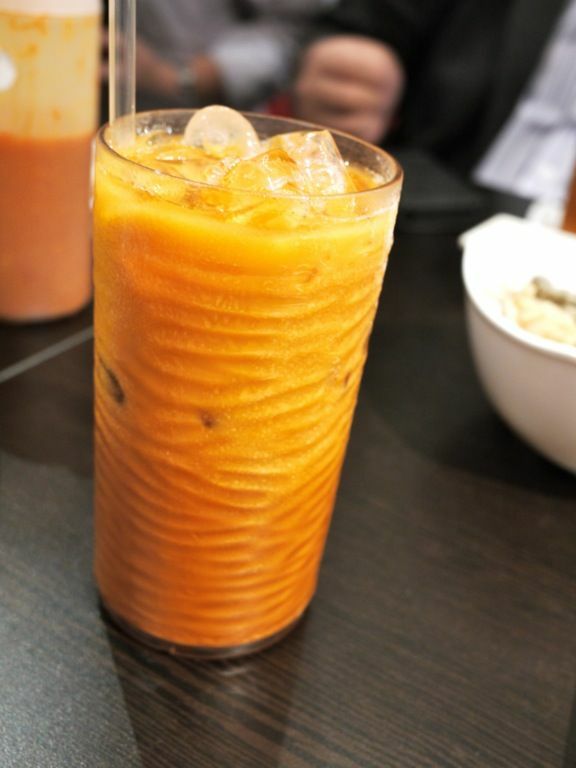 Love the Chai Yan (thai milk tea) which is strong (it kept me up all night). It also has a bit of that rose syrup taste to give it that unique flavor. 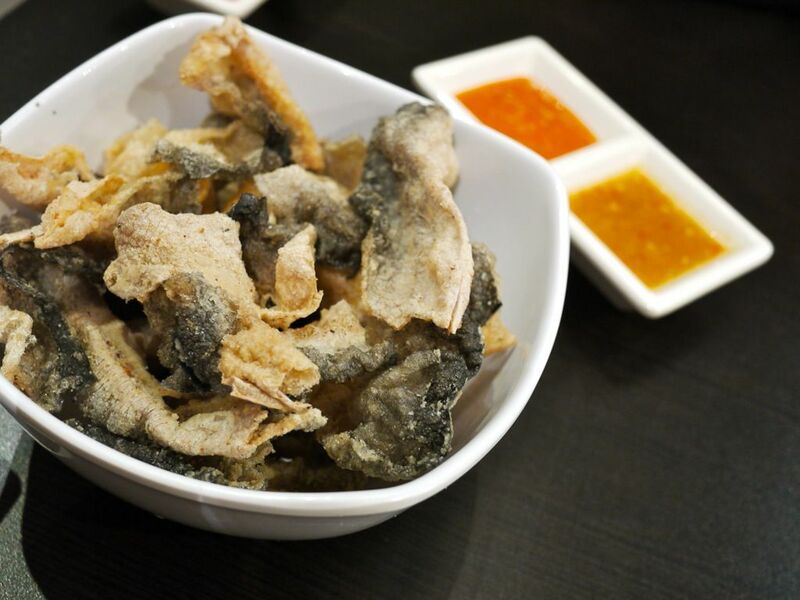 The fried fish skin isn't as scary as it looks or sounds. It's just a cracker in fact. Dip it into the lovely homemade dipping sauce made from 31 different ingredients, painstakingly prepared through 6h of non stop stirring over the pot. Both the Spicy BBQ and Sweet Sour Seafood sauce were fabulous. Set Moo or Set Gai (Pork or Chicken, $39.90/set) comes with quality seafood and MSG free marinated meats that are freshly prepared every morning. The set includes fish/pork balls, squid, luncheon meatm cheese hot dog, Hokkaido scallops, Surimi crab sticks, prawns and squid alongside cheese tofu and marinated meats. 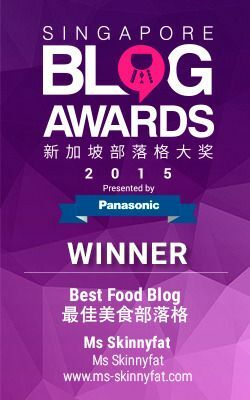 The kang kong, golden mushroom, tang hoon (rice vermicelli) and cabbage are also included. 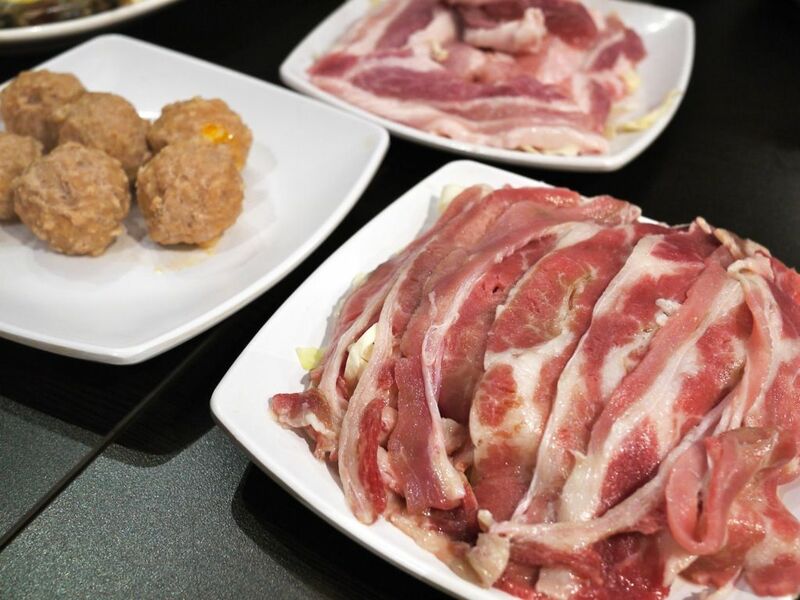 Add on the Kurobuta Pork and Angus Beef for more of that meat! The special Cheese Balls are also fantastic. We were warned to be careful when we bite into the balls as the cheddar has been known to squirt. Shortly after Shaun warned us, we witnessed for ourselves the range this ammo can achieve, a good 1m and the piping hot cheese sauce landed on Shaun. Hilarious (not for him of course). Another trick i've learnt is to throw in the glass noodles (tang hoon) into the soup at the end of the session so that it'll absorb all that umami goodness from the meats. In all, a satisfying meal. 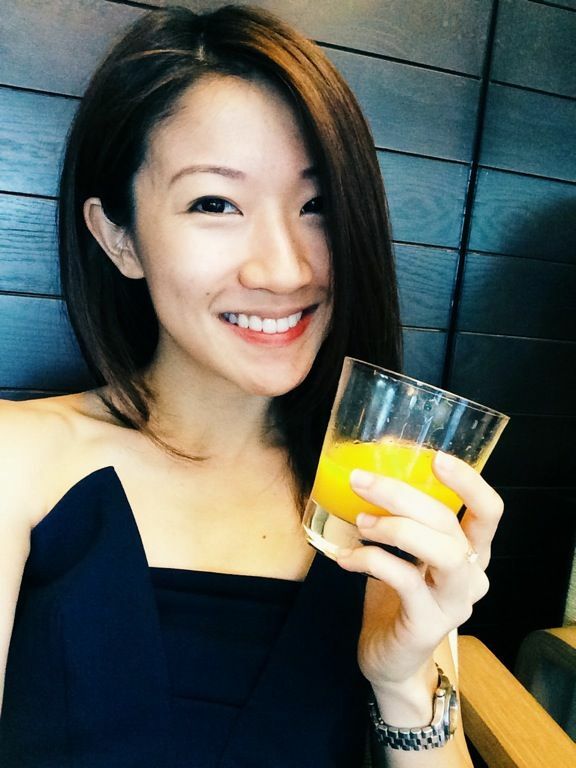 MooJaa also does other Thai dishes like Green Curry Chicken, Pineapple Fried Rice and Basil Leaf Pork. I do enjoy the smoke free and airconditioned venue, as well as the lack thereof Thai disco club crowd. It can be expected you will not see me at Golden Mile. You could be nice and bring the Thai food to me please. MooJaa and Nakhon are enough to sustain me for now.